Do you ever find yourself looking around and all of a sudden you realize that you are living such a happy life? I don't mean just that moment, but the time surrounding that moment and that chapter of life. I am a pretty optimistic person so I normally take note of the happy moments, but even I need to stop sometimes to realize that those moments have turned into days, weeks, months, and chapters of life. On Thanksgiving Day I had a particular moment where I was not only thankful and blessed but happy. That morning I had woken up and the first thing on my agenda was to make some French Press coffee and turn on the Macy's Day Parade. It was about ten till so that gave me plenty of time to do those few tasks and get settled in time to start the parade. About half way through the parade I got up and started my pie that you see above. I love trying new things and was anxious to get in the kitchen and get this started. After trying my hand at making pie crust from scratch I made the pie filling and loved every minute of it. Anytime that I get to spend time in my kitchen with no real agenda or schedule I am one happy girl. It is my happy place! After my pie was finished it was time to head to Thanksgiving lunch at my parents. 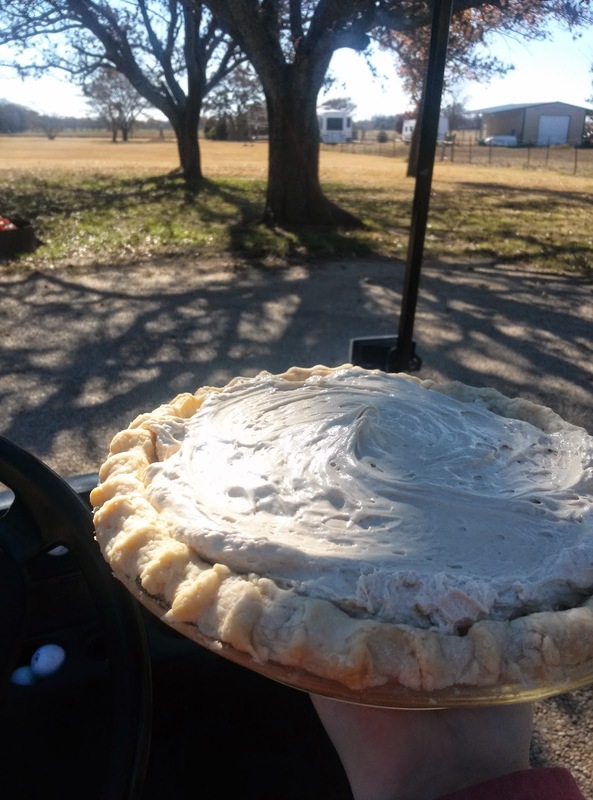 So I put on my jacket hoped, in my golf cart and as I was backing out of my garage pie in hand to drive across the field to my parents house I smiled to myself and stopped to realize how blessed and happy I am. And not just in that moment, but in life. I am happy with my home, work, life, faith, family, and friends. What more can one ask for? Thanksgiving day was simple and easy and I loved every minute of it. No fancy dinners, no driving into the city in traffic and no fuss. I loved every minute of the day and the entire weekend and am so thankful for the reminder of how happy I am with my small town ranch life. It is funny sometimes how we need reminders of even the good things. What makes you happy? What is your happy place? Thinking of you! Hugs and blessings!